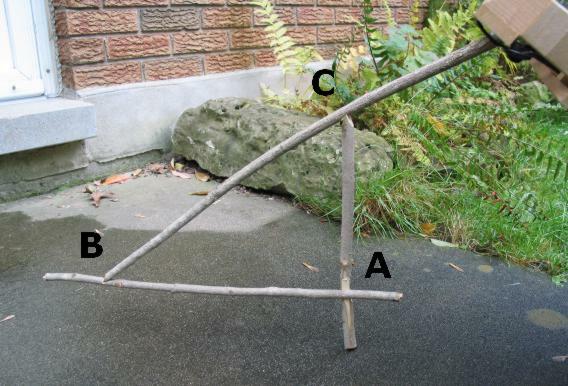 A Figure-4 Deadfall trap relies on a trigger that is roughly in the shape of the number "4", hence the name. The mechanism of this trap is explained in detail at the bottom of this page. 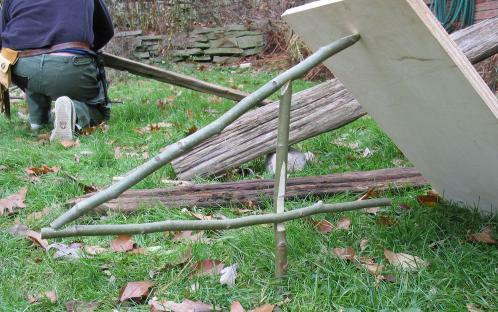 Here is a nice overview photo of the Figure-4 Deadfall trap mechanism. 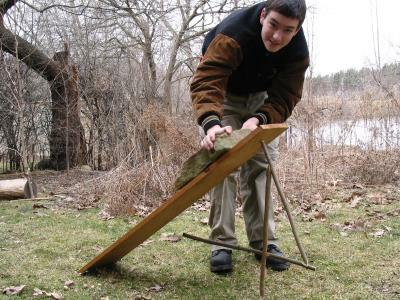 A figure-4 deadfall trap set, using a pine board to simulate a deadfall, with a rock on top for weight. 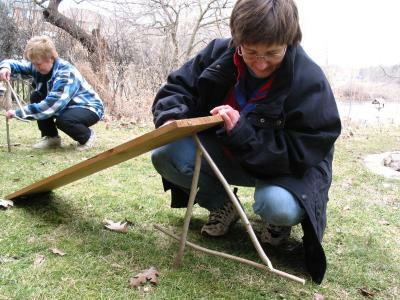 Another figure-4 deadfall, again using a pine board to simulate the deadfall part. 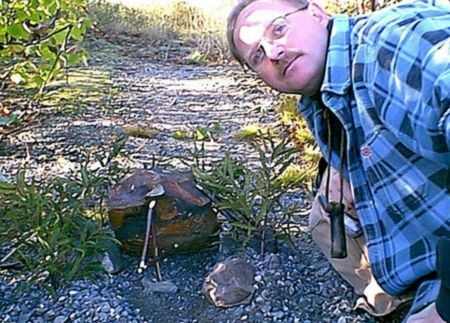 Trap and photo by Allan "Bow" Beauchamp Here is a small figure-4 deadfall in a bush situation. 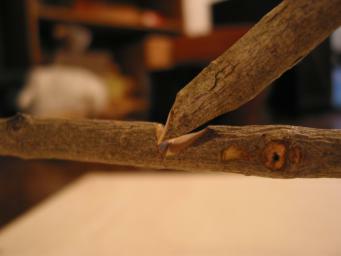 The diagonal stick is also held in place by having the end rest in a notch at "B". The pressure of the diagonal stick is pulling the horizontal stick towards the left. The horizontal stick is held in place by the notches at "A". "A" is where the actual trigger mechanism is located. 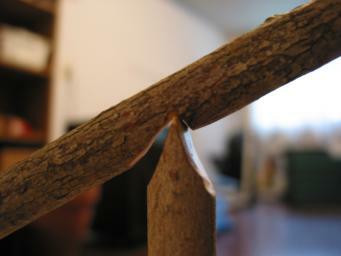 The bait is placed at the end of the horizontal stick to the right of "A" (this stick can be made longer as necessary), so that it is located directly under the weight. When the animal takes the bait at the end of the horizontal stick, the trigger at "A" is released. The horizontal stick falls to the ground, and the diagonal stick flips up and out in a counter-clockwise arc. This allows the weight to come crashing down on the animal, killing it instantly. Looking down along the vertical stick. Note that the vertical stick has been squared off. 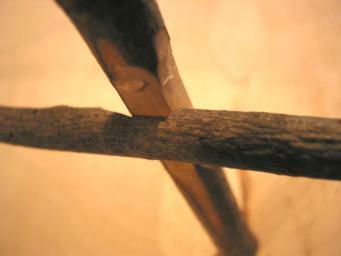 The horizontal stick has a square-ended notch cut into it. The pressure of the diagonal stick is pulling the horizontal stick to the left. Here the diagonal stick is pushing the horizontal stick out towards the left. The pivot point at the top of the vertical stick. This holds the diagonal stick in place, preventing it from slipping away to the left.